1 What are device driver? So, let’s dive in straight to the article and understand the overall concept of the drivers, their importance and how to update them with the latest Top 10 Best Windows Driver Updater. Drivers are the software codes that provide a software interface to hardware devices, enabling operating systems and other computer programs to access hardware functions without needing to know the details of how hardware is used. Complex? Let me simplify it for you. In a layman language, you can think of a driver an interface which tells the operating system how to use the hardware without looking up in the intricate working of the hardware. 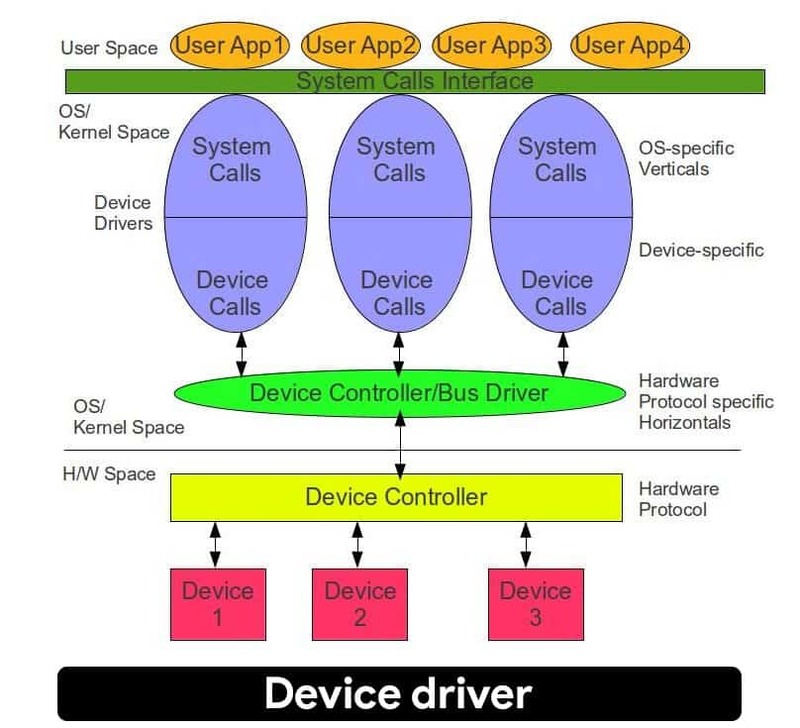 Device drivers are a set of software instructions that control the interface between a computer and the connected peripheral device. Device drivers tell your machine what the device is, what the device does, and all the other instructions needed for proper operation. Each device, no matter whether it is small or big comes with its own device drivers. And whenever they are connected with a computer first the drivers of that devices are installed to make the hardware in accordance with the operating system so that the user can use the device properly. You can understand this correctly through an example. You might have seen that whenever you connect a new piece of USB in your laptop or computer, first the device drivers of the USB installed first to help the hardware to work properly with the attached device and enable the user to see its content. Why it does so? It’s just because the computer does not know the device connected, it does not have information installed in it to handle all types of USB device. If there is no device driver installed, you will not be able to see the content of the attached device which is USB in this case. Therefore, the computer needs something to tell it what to do, and device drivers are the one responsible for guiding the computer. As you will go deep into the drivers, you will find that these drivers can run on user mode or in kernel mode. But the user mode is more preferred as the device drivers running on user mode cannot crash the operating system if there is a bug on the driver but on the other hand kernel mode transitions usually impose a considerable performance overhead, thereby limiting user-mode drivers for low latency and high throughput requirements. The computer is a very complex machine and it consists of two parts, Software, and Hardware. An operating system helps them in working in a mutual condition so that end user can make the use of the hardware attached using the software installed. Mainly computer comes with the support of general hardware devices, but it is not like that you can go in the market, take any device and it will work perfectly fine with your computer. It will not as each device is different and comes with a different set of drivers to make it work on the computer. The thing is, you need to have a device drivers to your computer to work between your new hardware and the computer itself. If there are no device drivers, either the hardware will not work correctly or you will face some glitches in the working of the hardware. If we go in the technical aspect of the driver, then the primary function of the device drivers is to provide the abstraction by acting as a translator between a hardware device and the applications or operating systems that use it. If you are wondering what abstraction is, Abstraction is the process of hiding out the vital information, coding or the working of the program from the end user allowing them only to see the end result. Understand it like that, when you drive a car you push the accelerator, and the vehicle moves fast. You don’t know, or you’re not interested to know what’s happening inside the engine, as all this information is hidden to you. You only see the end result – this is what Abstraction is all about. So by this point, you all know what device drivers and Why it is so important are. The next thing is to know, why is it important to continually update the drivers. Change is inevitable; everything requires change as to always remain up to date with the current environment and in this case with the current technology. Device drivers also fall in this; there is a need to update the device drivers software from time to time, to ensure their proper working. Over the period of time, device drivers become corrupt due to various bugs and viruses that they have to face from time to time which results in their glitchy performance. To avoid these, it is advised to always use the latest version of your device drivers software. You can easily install it from either downloading it from the official site of the respective drivers or by simply buying a DVD for the driver you want and install it. Many people prefer the first method i.e. to download the driver from the internet and install it. It is essential to install the new version or update the older version of your device driver. There are many windows driver updater software which you can use to upgrade your windows driver. Driver Booster is one of the best free windows driver updater software. 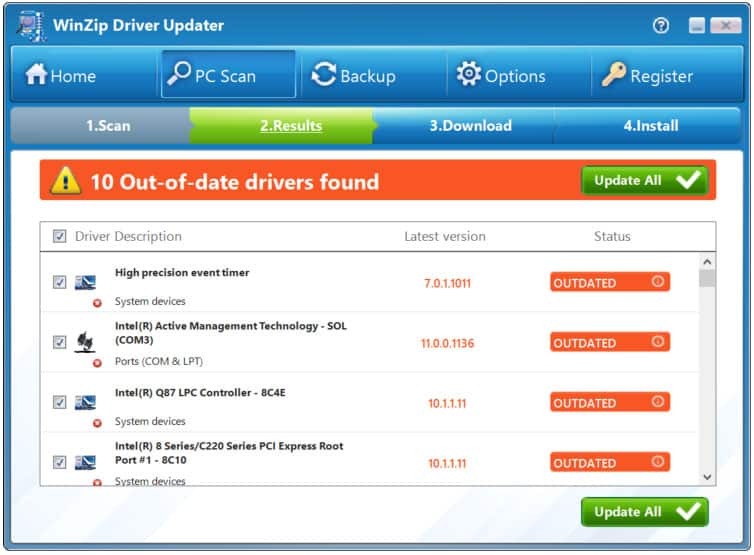 Installing drivers manually and updating them can be quite hassling some time but not anymore with this free software. 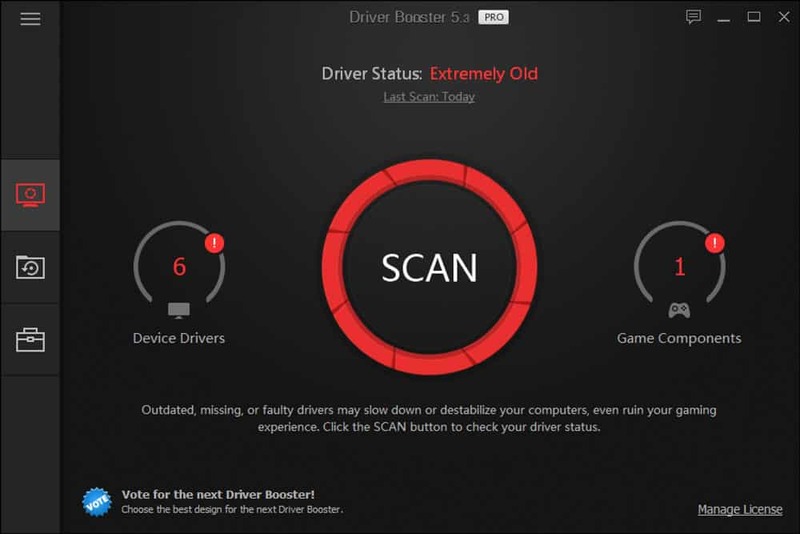 Driver Booster can scan your complete system for outdated drivers and with just a couple of clicks, can download them and install them all by itself. It also saves you a lot of time as every driver package is downloaded in the batch which makes it so so easy to download multiple drivers for windows in just one click. Also, you can manually select the device drivers package which you want and which you didn’t. Along with all these, you also get 200% larger database that can update 1,000,000+ drivers which is more than enough for anyone. The best thing about this is that it can also be used for updating gaming components for their smoother experience and also fix all your device drivers related errors that fixes system vulnerability due to drivers. It also automatically scan & identify outdated, missing & faulty drivers, so you don’t need to manually check each driver if that driver is obsolete or not, you can easily rely on Driver Booster, and if you want to experience its full power you can also go for its pro version which comes with more features. DriverPack Solution is another window driver updater software which is used by many because of its free nature. With this, you can download and upload all of your outdated software in just a couple of minutes. Although the downloading package is quite large, and it will take a while to download and install the DriverPack Solution, but once you are done you are good to go. It runs a system diagnostics when you scan the computer to reveal the computer name, BIOS type, RAM, hard disk device name, system name, and antivirus status. During this, all process the DriverPack Solution will show a progress bar along with a side window in which all the drivers are listed with their current installed version and the latest released stable version. It will ask you a system restart before actually downloading the drivers and installing them. You can also save logs with the app’s entire activity to the current folder, as well as take backups of all the drivers from the DriverPack database or the system. 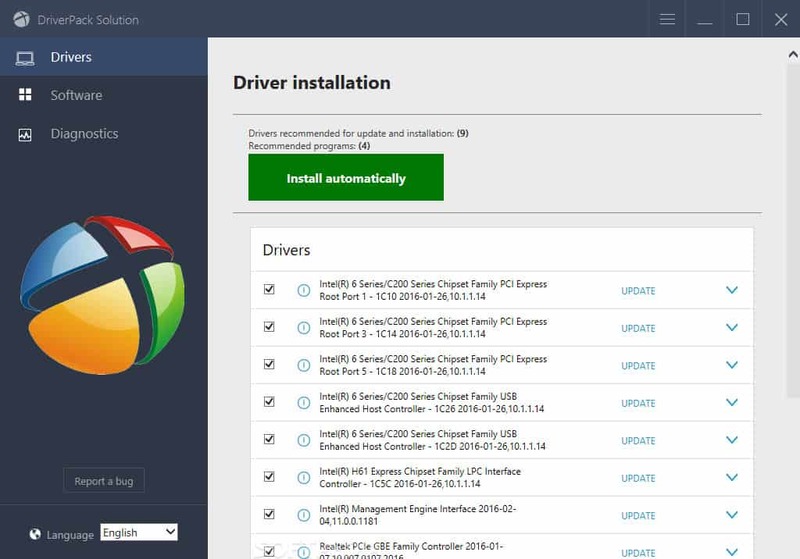 Driver Talent is a free driver updater tool that you can use to update your outdated windows drivers. This software finds the outdated windows drivers in your pc with just a simple scan and updates them. This software will save you from manually looking up to each driver and looking for its updates. Although this tool comes in a premium version also, so if you want to explore and enjoy its entire features then you must have to go for the premium version. But this fact doesn’t make the free one useless, it still works and is capable of doing a lot. Driver Talent comes with a very clean UI which makes it so easy to use for that person also who never uses this kind of windows driver updater tool. The best thing about this software is that it doesn’t require any high configuration to run. It can run easily on your pc and with just a few clicks can replace the outdated windows device drivers with the new one. 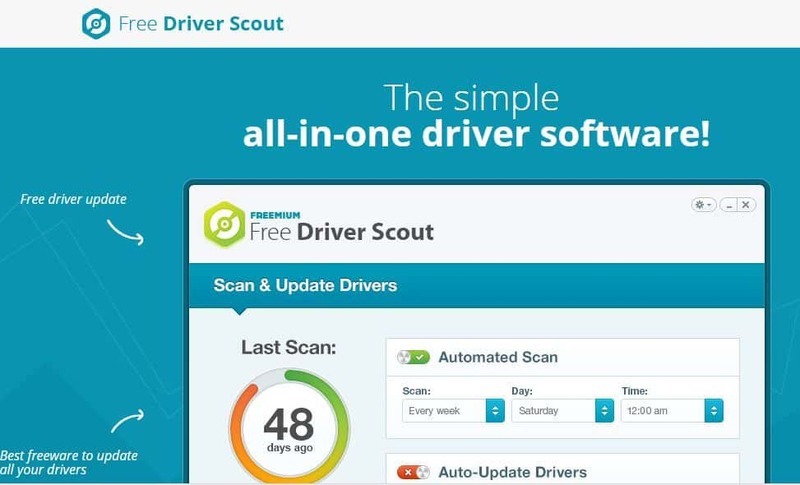 As the name suggests, Free Driver Scout is a free windows device driver updater tool, i.e., with this tool, you can detect the outdated device drivers in your pc and replace it with the latest version of that. As it is capable of finding the outdated drivers and installing the new one on its own, you can still select or manage the drivers which you want to install. You can’t underestimate this windows device driver updater tool because it is free, believe me, it is one of the best device driver updater tool in the market. In some case we install or update the latest version of the operating system; in that scenario tell the release of OS that you are going to install or installed and it will automatically download all the required device drivers even before you start to update your operating system. Winzip Driver Updater is one of the best device driver updater tools that do the same job as all the above i.e. it will scan and figure out all the outdated device drivers in your computer and install the latest version of them to ensure the proper working of the drivers and hardware. The thing which makes it different from the other is the fact that it will give you the exact information from where the software is downloading the device drivers software. Winzip Driver Updater will show you all of this information so you can also check the credibility of the source location on your own. It also allows you to have backups before the updating of the driver start which is a pretty useful feature in case of accidental data corruption. And if by any case you downloaded the wrong or corrupt drivers, there is no need to worry about that as Winzip Driver Updater also provide a solution for that. You can revert the changes to the previous version, and you are good to go. Compatible with the latest version of the windows, Driver Reviver can also be listed in our list of best Windows device driver updater software. It comes with a powerful pc scanner which scans all of your pc outdated and defected drivers, and with many other features which makes it one of the best in its game. It comes with a free and premium version; you can choose the one which is perfect for you and in your budget. 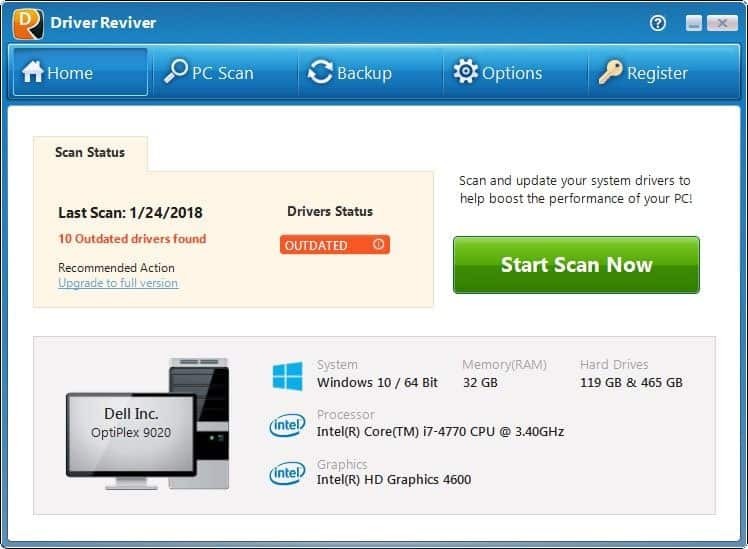 For updating the outdated drivers, all you need to do is to install the Driver Reviver software, scans the pc, and it will show you the list of outdated drivers. Just click on the update button, and it will automatically download and install all the latest version of the driver for you. Other than that, If you want to look up to for its credibility in the market, then the Driver Reviver is created and developed by ReviverSoft, which is a software company that is acquired by Corel in 2014. So, If a company like Corel is behind this product, then you can get an idea of the credibility of this device driver updater tool. 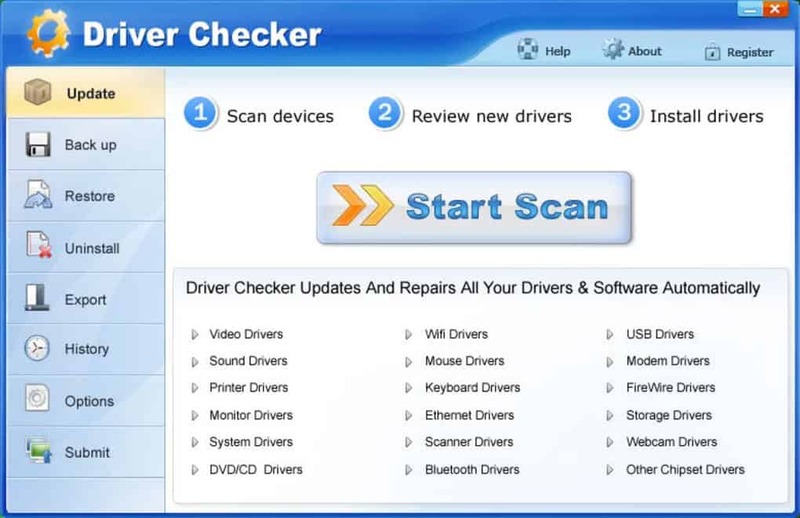 Driver Checker is another Windows device driver updater software which has all the qualities to be listed in this list. It can help you in updating all the outdated and defected device drivers in your computer, and along with this its provide you the flexibility of the pair of exclusion and uninstall options. Every product comes with some pros and cons. The only thing you must have to note about the Driver Checker is that it is not compatible with the latest version of the windows, i.e., Windows 10 although it runs perfectly fine in the earlier version of the windows. The clean and simple UI of Driver Checker give it a classic and sleek layout. And along with this, the software lets you schedule scans so that you can scan your system later and it also provide the feature of taking backup and restoration of your drivers. 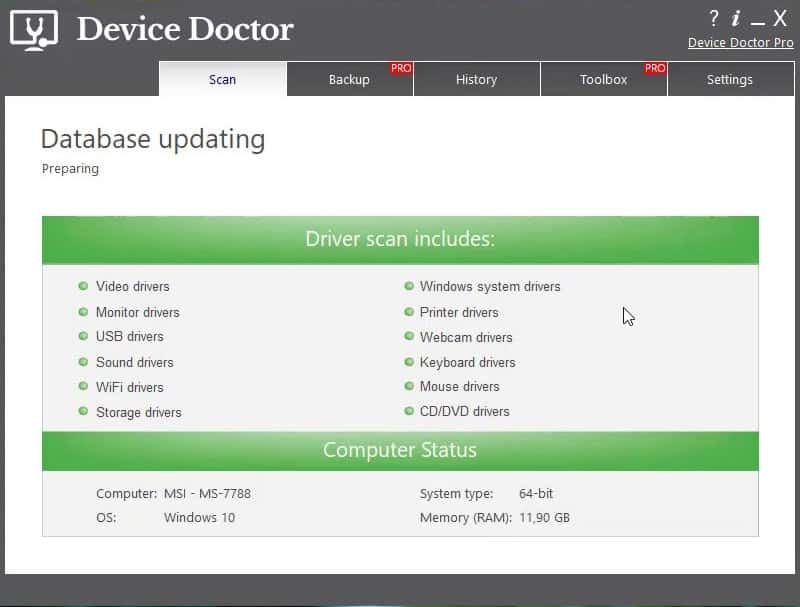 Device Doctor is a free software that lets you quickly update all of your outdated windows device drivers in just a couple of clicks. However, it is not the perfect one, but it does the job quite well. Once you open the app after installing it, it will ask you for a manual approval to start the scan, while in the previous ones this process begins automatically. It will also remind you to take the backup of the system before updating the drivers as a security major. As it is free windows device driver updater, we can’t expect it to do everything for us but yes if you are unable to find any other one, then you can surely go for this Windows driver updater software. 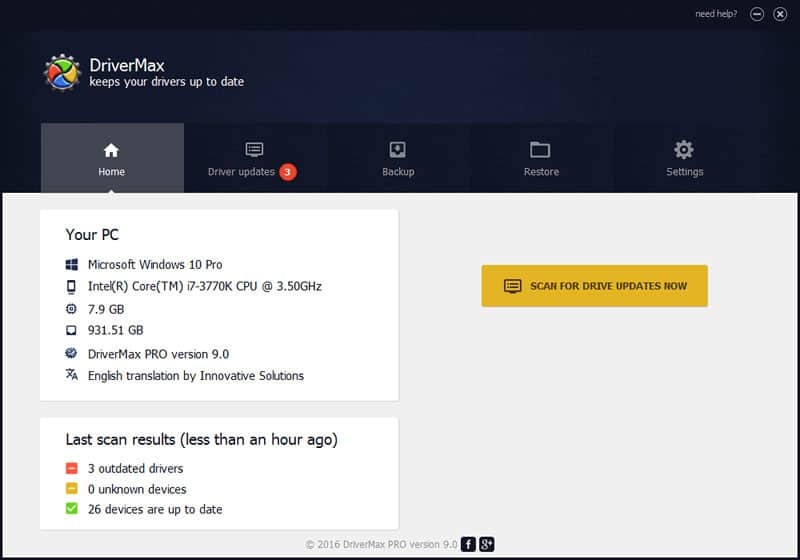 DriverMax is yet another Windows driver updater tool. It comes in two packages one is free, and the other one is premium. The things are, in the free version you are limited to download a certain number of drivers per day and per month contrary to that there are no limitations in the premium one and this makes sense too as at the end they also want to earn money. DriverMax is compatible to all the latest and earlier versions of the windows so no matter what type of windows operating system you are using, DriverMax is capable of running on each of them and help you in updating all the outdated drivers in all of those versions. You can schedule the scan with DriverMax to anytime, and once the scan is done, it will give you a list of all the outdated drivers along with the drivers which are already in their latest version. The best thing I like about this tools is the ability to revert the changes done. Let’s say you uninstall the defect version of any version which is causing more problem to your pc, and you can always roll back to the earlier version of that driver in just a couple of clicks. Finally, We came to an end. Driver Navigator is the last Windows device driver updater software in our list. And the purpose is the same as all of the above i.e. it automate you device driver update process. The process is same; once you installed the app, it will ask for a system scan and list out all the outdated device drivers. On your confirmation, it will batch download all the latest version of the drivers and install them automatically reducing your work. Keeping the fact in mind that it is free to download and use, it is a great deal that it provides you the functionality of making restore points before updating the drivers in the case where anything goes wrong. Although there are a lot of premium device driver updater; which provides more feature then this but as it is free and does the job well, it also deserves to be in the list no matter in which position. So, guys, these are some of the best Windows device driver updater software. I have tried to cover all the things associated with the drivers, and I hope that you enjoyed this content. If by any chance you are still facing any doubt feel free to comment, we will respond to asap. And at last, if you liked the article, don’t forget to give it a share.